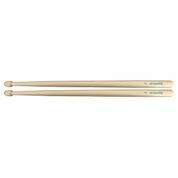 Grand Slam IQ1 Snare Drum Sticks - Natural - Robert Geary Ltd.
acoustIQ Grand Slam IQ1 snare drum sticks are precision manufactured exclusively in the United Kingdom using superb quality Maple. The Grand Slam IQ1’s great balance, feel and feedback on the drum and practice pad deliver the control and clarity across the full dynamic range that you would expect from a professional pipe band and marching snare drum stick. All acoustIQ Grand Slam IQ1 snare drum sticks are beautifully paired featuring the acoustIQ brand livery, quality at exceptional value.